On week 2 there were 28 recipe posts shared. Many people were talking about Veganuary but I like to go against the tide. My favourite recipe was not vegan but was so full of delicious flavours I just could not do a 'best of' round up without featuring this Lamb Salad with Goats Cheese, Apricots and Almonds from Charlotte's Lively Kitchen. This salad, for me, is the perfect combination of flavours, the sweetness from the apricots with the creaminess from the goats cheese paired with the crunch of almonds and the tender lamb and salad. Perfection! On week 5 30 recipes were shared. To make choosing recipes a little easier for me I decided to alternate between savoury and sweet. When I first saw these White Chocolate and Raspberry Creme Brulee from The Gluten Free Alchemist she had my undivided attention. Both the hubby and I adore creme brulee but Kate has gone one step further by adding white chocolate and raspberries which makes this a must try dessert! On week 7 there were 36 recipes shared but it was the Wholewheat Tagliatelle with Rocket and Hazelnut Pesto from The Veg Space that left me wanting more. This wholewheat tagliatelle has been tossed in a pesto with a difference. Forget a basil pesto, this pesto has been made using rocket and hazelnut which, I am sure, is even tastier than the traditional pesto! On week 8 there were 40 recipes shared. I have to admit that I was pleased that I had to pick a sweet recipe for week 8 as this Rhubarb and Custard Genoise Cake from Only Crumbs Remain is simply irresistible! Angela has a fantastic talent when it comes to decorating and this cake is no exception! On week 10 there were 39 recipes shared. That week the recipe that stood out was from the queen of easy lamb dishes, Eb from Easy Peasy Foodie. She shared this vibrantly coloured Easy Lamb Jalfrezi. Every time I read one of Eb's lamb recipes I always leave thinking how I need to cook and eat more lamb. If you need some lambspiration, Easy Peasy Foodie is the place to go! On week 11 the majority of the 32 recipes that were shared were sweet recipes. As we were nearing Easter the natural choice had to be the Cadbury's Creme Egg Scottish Tablet from Foodie Quine. Creme Egg's are a bit like Marmite, you either love them or hate them but at Easter they are definitely a foodie bloggers favourite addition. 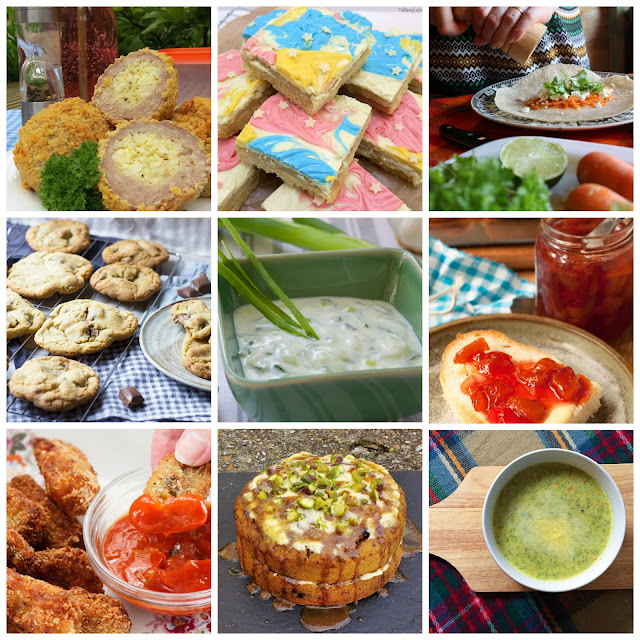 On week 13 the Easter theme continued through the 39 recipes shared. But after an overload of chocolate I was certainly ready for a healthier dish. Salmon is a meal that I always love so this Sweetheart Cabbage and Dill Salmon recipe from Everyday Healthy Recipe is a lovely, light meal that is certainly guilt free! On week 14 spring was definitely in the air! One of my must have Easter chocolates has to be the good, old, mini egg. They are such a versatile ingredient for sweet treats. Searching for Spice has combined the mini egg with coconut to create these Coconut Macaroons topped with Mini Eggs. Together they are a light bake with indulgent chocolate on the top! On week 18 you could feel the excitement for the arrival of summer. That week the 32 recipes were all lighter, summery meals and treats. These Gluten-Free, Egg-Free Scotch Eggs from Glutarama look like regular Scotch eggs, but looks can be deceiving, these Scotch eggs are both gluten free and egg free, yes you did read that right, egg free! Genius! On week 22 34 delicious recipes were shared. But it was these Unicorn Millionaire's Shortbread from The Baking Explorer that really caught my eye. Little I is unicorn mad, she loves them and what is there to not love? Kat has combined the magic and girliness of unicorns with a classic millionaire's shortbread. If you want to make a unicorn lovers day, then make these! When week 26 came along we had decided to purchase a tent for some camping holidays. So when I came across Beach Hut Cook blog within the 30 recipes shared it became a go to blog for when it came to ideas for camping recipes. These Crispy Feta and Carrot Tacos would be an ideal camping meal but also a great meal to cook at home! For week 30 we were into summer and the summer holidays were about to start and the linky was quieter. After a busy first term back at work I was looking forward to spending time with the children. We all love baking so finding a baking post out of the 21 posts shared was top of my list. I knew that these Soft Bake Cookies from Proper Foodie would be a perfect recipe to make with the children. Plus, everybody loves a good, soft, bake cookie, especially ones that are full of gooey chocolate! By week 33 we were well and truly in summer mode but there were still 29 recipes shared. With summer mode comes eating al fresco. As a family we love dining outside having picnics or even better, a good BBQ. So I knew that Perfect Greek Tzatziki from Jo's Kitchen Larder would make the perfect accompaniment. Week 38 and September came which meant back to school and back to work. After the holidays the linky picked up again and 33 recipes were shared. Preserving is something that I love to do but do not do enough of but this Peach and Pomegranate Jam from Recipes Made Easy has left me yearning for peach season to arrive so that I can try making this jam! With week 42 came plenty of Halloween inspiration as we neared the end of October in the 46 recipes shared. October is also pumpkin season. In my opinion pumpkin flesh is not used as much as it should be. I hate food waste so at that time of year pumpkin recipes are always top of my list so when I saw these Vegan Baked Cheesy Pumpkin Tots from YumSome I knew I had to bookmark them for future Halloween times! By week 46 the Christmas recipes were starting to come through in the 43 recipes shared. But it was another pumpkin recipe that caught my eye. The Peachick's Bakery has transformed my favourite cake, carrot cake, into this Vegan Pumpkin and Carrot Cake. A cake that contains not only carrots, but also pumpkin must equal two of your five a day don't you think? Finally on week 50 there were an amazing 50 recipes shared! Wow 50! Christmas was everywhere but my favourite had to be a recipe that would be perfect as a started for your Christmas day dinner. This Broccoli Cheddar Soup from Chaos with Coffee would make a great alternative to broccoli and Stilton soup, which I love, but the kids don't, so by using Cheddar instead I am sure everyone would love this soup! Over the 17 weeks of CookBlogShare a whopping 601 recipes have been shared and I thank you for each and every post. I was so hard to select these 17 posts as I have enjoyed reading all of them. Now over to you. The linky is live as normal and I look forward to seeing what you have been cooking up. Next week the linky will be with Monika at Everyday Healthy Recipes. I have updated the calendar and it can be found on my CookBlogShare page. I would like to wish you all a very merry Christmas and here is to a delicious 2018! What a delicious year it's been! Thank you for putting together this fabulous collection and for including one of my recipes in it too:) I've just linked up my new recipe and I'll be back soon with another one. Hi Kirsty, wow, nice post on cook blog share and so many good recipes. Thanks for hosting. MERRY Christmas and happy holidays. It's such a lovely idea to include a round up of the whole year! There are some lovely recipes and thanks so much for including my coconut macaroons. Thank you Kristy. 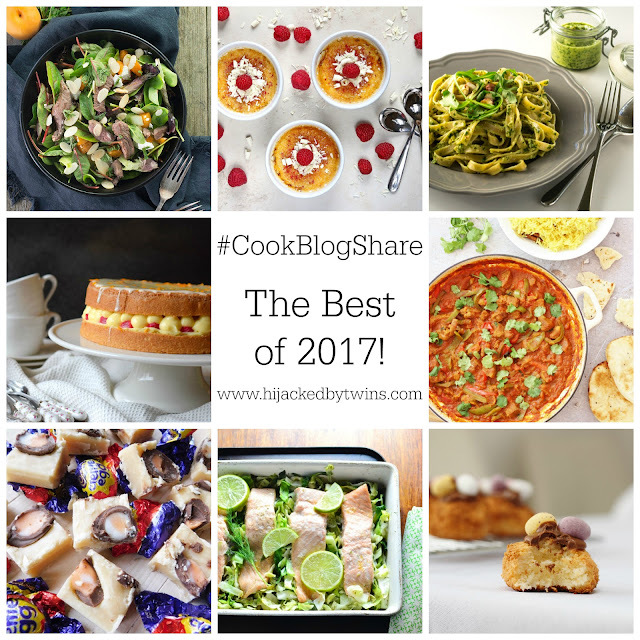 For sharing these amazing food blogs. More choices and definitely still yours the best.